On September 30, 2014 The Christensen Fund launched the “Biocultural Landscape,” an interactive web portal that illustrates the intricate connections that determine the vitality of Indigenous communities and ecosystems across the globe. A biocultural landscape is an intertwined holistic system that has been shaped by human management over a long periods of time. 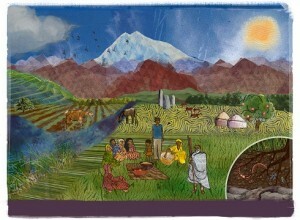 The “Biocultural Landscape” portal draws out links across six main sections: bounty, culture, inhabitants, cycles, beauty, and interconnections. The culture section, for instance, explores how people have worked out the distribution of water and nutrients through an ecosystem, say, from a mountain top down to a valley. The knowledge of this biocultural phenomenon has led to physical interventions like canals and yielded cultural practices like unique water dispersal systems and decorative arts that attempt to capture the local environment. The Christensen Fund hopes that users of the portal will come away with an understanding of the importance of “resilience” — that is, the ability of a landscape to withstand and recover from shocks and stresses from within and without. The more strong and positive interconnections in a landscape, the better it can withstand such shocks. I visited the site and it is beautiful and informative. However don’t take my word for it, visit it at http://www.christensenfund.org/experience/biocultural-landscape/. The Christensen Fund is a private foundation founded in 1957 and based in San Francisco, California. The Fund believes in the power of biological and cultural diversity to sustain and enrich a world faced with great change and uncertainty, and focuses on the biocultural — the rich but neglected adaptive interweave of people and place, culture and ecology. You can learn more about them at www.christensenfund.org.